I finally reached the point where I just felt that I needed to clear out my garage so that I could fit both of our cars in the garage. Water splashing from our front sprinklers was starting to leave hard water stains on our cars – which is not a good thing. In order to make enough room to fit both vehicles, I would need extra shelving in the garage. I checked out Costco and found some nice shelves that would meet my needs. I have a moderate amount of items that need to be stored, so two shelves would have been enough to hold my items. Each shelving unit costs $128.39, which would make two shelving units cost a total of $257. Do I really want to spend $257 on shelves to hold items that probably won’t make the same amount of money in a yard sale? Not if I can help it. Do I need the 1,000 lbs capacity of the shelves? No. Is there a chance I will need to move the shelves to a different area of the garage? Probably not. Judging from those answers I could quickly see that building my own shelves would meet all my needs. After getting the materials home it actually only took about an hour to put up. The shelves themselves are 2 feet apart. The hardest part was just finding the studs behind the garage drywall. I have a stud finder that only seems to work when it wants too. Now the part that most people hate about DIY projects is the part where you have to do it yourself. 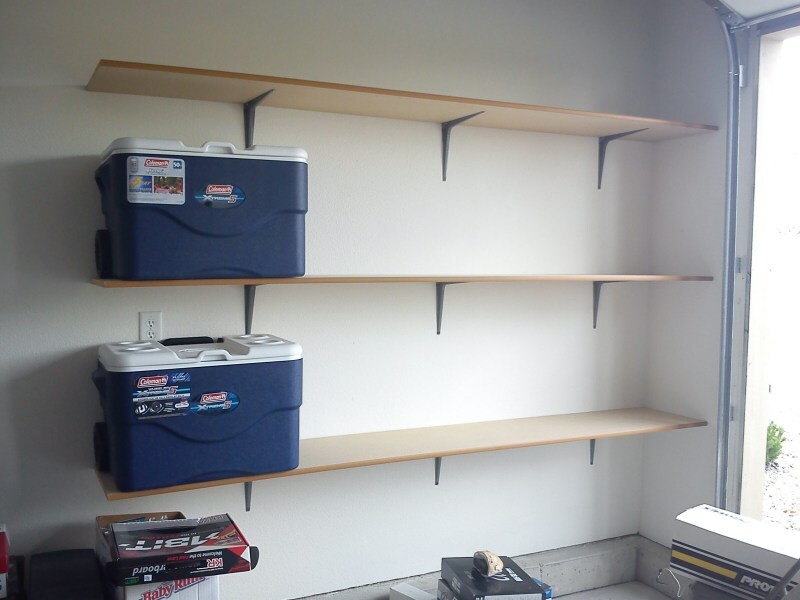 However, I reasoned that even if I had purchased the industrial shelves, I would have to assemble them as well, which may have taken almost the same amount of time. In the end I saved over $200 and took about the same amount of time and effort as buying manufactured shelves. I may add an extra support on the left side, if I decide to put heavier things on it.